Sen. Chris Holbert (R) on the Mexican border. The nonpartisan administrative head of the Colorado Senate who played a central role in processing sexual harassment complaints last legislative session was recently fired. Incoming Democratic Senate President Leroy Garcia let Secretary Effie Ameen go just before Thanksgiving. “I don’t think she was ever nonpartisan, it just didn’t seem that way with how things were handled by her,” said former legislative intern Megan Creeden, who filed a sexual harassment complaint against Republican Sen. Randy Baumgardner. The complaint was investigated and found credible, but Creeden questions why it sat on Ameen’s desk and was not released in time for a Senate vote on whether to expel Baumgardner from office. By the time it was released, it was too late in the session for Democrats to take formal action on the complaint. The process to address the sexual harassment complaints against Sen. Baumgardner, as our readers know, was seriously compromised by Republican Senate leadership–who successfully covered up corroborating investigations validating the complaints ahead of the hearing held on a motion to expel Baumgardner from the Senate. The motion to expel Baumgardner failed, but the subsequent disclosure of investigative reports that were already complete before that hearing obliged Republican Senate leaders to further sanction Baumgardner just before the session ended. Back in April, Birkeland reported that Senate Secretary Effie Ameen had received the second detailed report on Baumgardner–ordered by Senate President Kevin Grantham because he didn’t like the first report–on the exact same day that Senate Majority Leader Chris Holbert suddenly scheduled a vote on the motion to expel. The missing link in this chain of events very plausibly could have been Ameen improperly tipping off Senate GOP leadership that it was bad news for Baumgardner, ahead of even the victims knowing that–prompting GOP leaders to rush the vote to expel prior to this being disclosed. Today’s controversy appears to revolve around the fact that the new Senate Majority is not formally in charge yet, and Republicans say incoming Senate President Leroy Garcia jumped the gun. Even if that’s correct, it’s a nonissue come January–and either way, it pales in comparison to the much more important question of what to do about Randy Baumgardner. That’s the question Kevin Grantham avoided at all costs–and Chris Holbert didn’t want to confront as the minority. But now, that reckoning appears on the horizon. Today’s action is just a sideshow to the main event. Garcia may not be able to fire her yet, but there is nothing to keep him from suggesting that she might want to update her resume between now and the opening of the 2019 session. If Senate Republicans were smart, they would pressure Baumgartner to resign before this spectacle is again front and center. I seriously doubt that will happen. But it's worth pointing out that there's at least one person who's putting himself at the front of the line for Baumgardner's Senate seat once it's vacant. Probably not. And they get to own the ensuing shitshow. You can stop there I think. Being "let go" doesn't automatically translate to "fired." Curious that neither the Secretary (a supposedly nonpartisan employee elected by the entire Senate) NOR the incoming Senate President is willing to go on the record about how the departure happened. No "end date." No "last paycheck" info. The last time I was "let go," (round 3 of the corporate lay-offs), I stopped working in mid-November, was paid through mid-December, and health benefits continued until May. One of my colleagues "let go" at the same time continued working (same title, phone number, and responsibilities) until a project was passed off in the latter part of January — but was considered a "consultant" after the mid-November date. Trying to clarify a date with the Unemployment folks eventually required a conference call with the HR department of the corporation. 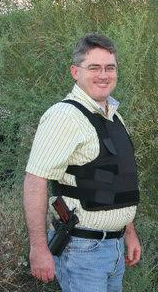 That photo of doughy lilywhite needledicked ammosexual Chris Holbert never fails to make me lol.